Served with “dilled” shrimp salad, cucumber salad and fresh salad greens. Cook quinoa in water as directed on package (bring water and quinoa to a boil, reduce heat to slow simmer and cook till all the water is absorbed; 15-20 minutes) and remove from heat. Meanwhile, prepare the remaining ingredients and place in a large glass or ceramic bowl. Pour hot cooked quinoa over the prepared ingredients, mix well and refrigerate to chill. Combine all ingredients in a glass or ceramic bowl, mix well and refrigerate to chill. This entry was posted in in the kitchen and tagged almonds, Asian, beans, cucumber, dill, dish, green, onion, recipe, red, salad, shrimp, side, summer, vegan, vegetarian on July 25, 2015 by lenapietri. Combine all ingredients in a bowl and mix well. Place in a glass or ceramic bowl, cover and refrigerate to chill if the rice is still warm. Serve as a delicious side (I prepared this salad as a side for seared/broiled tuna steaks with Asian inspired dipping sauces) or refreshing lunch along with salad greens. This entry was posted in in the garden, in the kitchen and tagged Asian, basil, cilantro, dish, fresh, lemon, peas, recipe, salad, side, snap, snow, style, toasted sesame oil on July 3, 2015 by lenapietri. Combine wild rice and water in a medium sized pot, bring to a boil over high heat, reduce heat to medium to simmer for 45 minutes. Meanwhile preheat a small to medium sized frying pan over medium low heat. Dice onion and sauté in butter (olive oil) under a lid until tender and translucent (stir occasionally so they don’t brown) about 10 minutes. Turn off heat and set aside. Strain cooked wild rice, return to the pot, add sautéd onions and butter, edamame, salt and pepper, stir and serve. Raw edamame in shell, raw edamame removed from shell, edamame blanched and shelled. Blanching and peeling raw edamame still in its shell: place 1 1/2-2 cups edamame with shell in a pot, cover with water, sprinkle with 1/4 teaspoon sea salt, bring to a boil, reduce heat to medium, cook for 5 minutes, strain and allow to cool so edamame can be handled/peeled. Simply squeeze the shell and the edamame will “pop” right out. 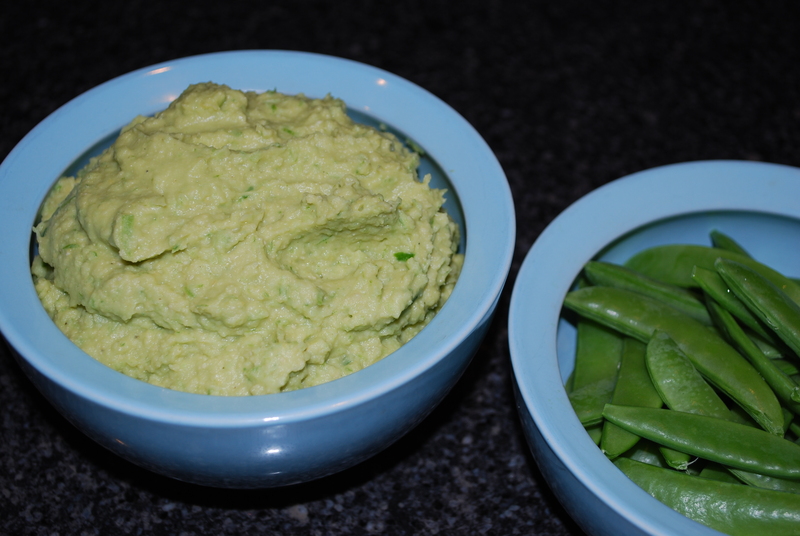 This entry was posted in in the kitchen and tagged blanching, dish, edamame, peeling, raw, rice, side, vegan, vegan option, vegetarian, wild on August 3, 2014 by lenapietri. Don’t throw away your beet tops! Use them like you would any green. Here is the quick side I threw together. Cut stems from end of leaf (you don’t need to remove the stem from the leaf itself). Soak the leaves in cold water, dunk and soak for a few minutes. Mean while wash the stems (rub them under water to remove any soil residue) scrub the carrots (I leave the skin on for nutritive value which is why I make sure the carrots are organic) and peel the onion. Remove the leaves from the water, strain and repeat the water bath. Meanwhile, cut the stems into 1 to 1 1/2 inch lengths and place in a medium sized bowl. Cut the carrots into like lengths then cut them the long way to about 1/4 inch and flip the stack of half the carrot and cut to 1/4 inch again making julienned carrots. Add the carrots to the bowl. Preheat a large heavy bottomed pan that has a lid to medium. Cut the onion in half and slice 1/8 to 1/4 inch thick half circles that will separate during cooking. 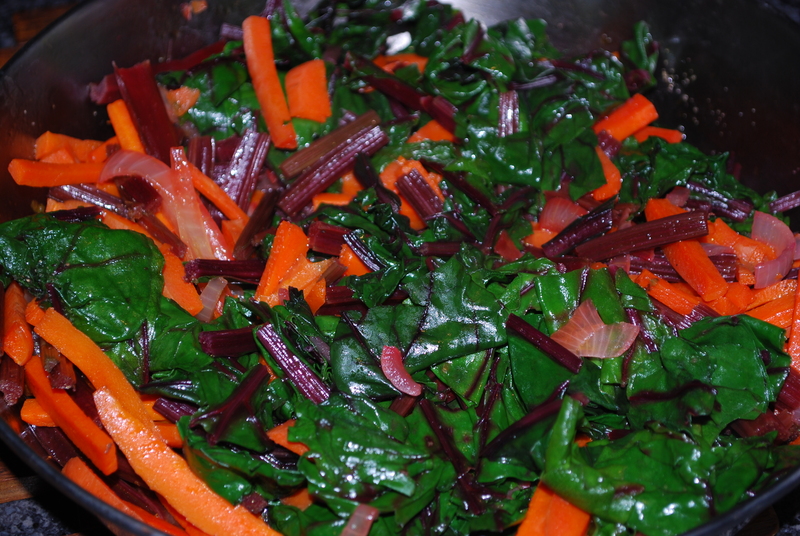 Add the olive oil to the preheated pan, add the prepared beet stems, carrots and onion and cover. Stir the vegetables while they sauté under the lid occasionally, I use a kitchen tong to kind of flip and turn the mixture. Remove the beet leaves from the water, strain and check to be sure the water is clear/there is no dirt in the bottom of the basin/bowl. Repeat the rinse and dunk until the leaves are clean. Strain the leaves then cut into 1 inch strips the short way. Add the greens to the vegetables and cover. In 2 minutes when the leaves should be wilted a bit stir the mixture, cover and continue cooking for 2 minutes. Stir, cover and give it another 2 minutes. Remove from heat and sprinkle with sea salt (I used about 1/4 teaspoon) and fresh ground black pepper (I used a couple pinches). This entry was posted in in the kitchen and tagged beet, carrots, dish, greens, leaves, onion, side, stems, vegan, vegetarian on July 8, 2014 by lenapietri. The lovely pale green color of the hummus is from the garlic scapes. I picked our first snap peas of the season to dip and served organic whole wheat pitas for Xav while I dipped gluten free blue organic corn chips. Cheese for those that eat dairy is a wonderful compliment and a soup (I made a scallop chowder). This is a version of my classic house hummus. Instead of using garlic I substituted with garlic scapes. Depending on how many you add you will get a light delicate garlic flavor or add more to intensify the experience. Traditional hummus uses tahini but my family prefers it without. If you like the traditional style add 2-4 Tablespoons tahini. Place all ingredients into a food processor or blender and process until smooth and creamy (this will take longer than usual since the scapes need to be ground finely). At this point you will see if more water is needed for consistency. Add more water one tablespoon at a time as you process. Taste and add more salt if needed. To add a kick you can add some cayenne pepper. Serve hummus with vegetables and/or crackers for dipping (gluten intolerant or celiac will find that tortilla chips dipped in hummus is delicious). To make this into a light summer meal add cheese and fruit. This entry was posted in in the kitchen and tagged appetizer, Chickpea, dish, fresh, garden greens, garlic, gluten free, home made, Hummus, light meal, Olive oil, recipe, scapes, side, vegan, vegetarian on June 24, 2014 by lenapietri.